The word is now a commoner …. Around a decade or two ago – not many here knew its pronunciation nor its meaning … all that changed on that Black Sunday !! – perhaps it occurred earlier too but not known by that name – perhaps a similar thing only undid Dhanushkodi – and earlier in 1930s …. ‘tsunami’ (from Japanese – a harbour wave) - a series of water waves caused by the displacement of a large volume of a body of water, generally an ocean or a large lake. Earthquakes, volcanic eruptions and other underwater explosions, landslides, glacier calvings, meteorite impacts and other disturbances above or below water all have the potential to generate a tsunami. Tsunami waves do not resemble normal sea waves, because their wavelength is far longer. The 2004 Indian Ocean earthquake was an undersea megathrust earthquake that occurred at 00:58:53 UTC on Sunday, 26th December 2004, with an epicentre off the west coast of Sumatra, Indonesia. The earthquake was caused when the Indian Plate was subducted by the Burma Plate and triggered a series of devastating tsunamis along the coasts of most landmasses bordering the Indian Ocean, killing over 230,000 people in fourteen countries, and inundating coastal communities with waves up to 30 meters (100 ft) high. It was one of the deadliest natural disasters in recorded history. Indonesia was the hardest-hit country, followed by Sri Lanka, India, and Thailand. In Insurance Law, the peril insured against may be any peril, which the assured seeks and the insurers are willing to give protection. The concept of insured perils signifies a very central issue under marine insurance where the assured’s property or profit are put at risk by maritime perils and the insurer agrees to indemnify the assured against any loss caused by those perils. The courts have attempted to draw a line between ‘perils of the sea’ and other perils like unseaworthiness, negligence, ordinary wear and tear, barratry, wilful misconduct, etc. An earthquake (also known as a quake, tremor or temblor) is the perceptible shaking of the surface of the Earth, resulting from the sudden release of energy in the Earth's crust that creates seismic waves. Earthquakes can be violent enough to toss people around and destroy whole cities. The seismicity or seismic activity of an area refers to the frequency, type and size of earthquakes experienced over a period of time. At the Earth's surface, earthquakes manifest themselves by shaking and sometimes displacement of the ground. When the epicentre of a large earthquake is located offshore, the seabed may be displaced sufficiently to cause a tsunami. Earthquakes can also trigger landslides, and occasionally volcanic activity. The Standard Fire and Special Perils Policy among other perils covers ‘wind and water perils’ – specifically stated as “Storm, Cyclone, Typhoon, Tempest, Hurricane, Tornado, Flood and Inundation”. The coverage however, excludes those damage resulting from earthquake, Volcanic eruption or other convulsions of nature. Under the present Tariff, earthquake cover is ‘add-on’ and whence so added, the words "excluding those resulting from earthquake volcanic eruption or other convulsions of nature" stand deleted. 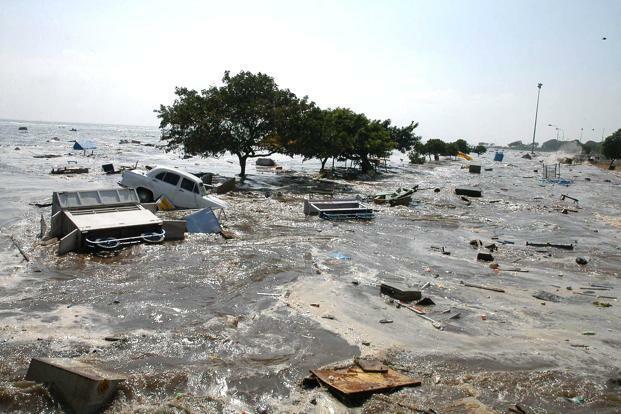 The Indian Ocean tsunami caused widespread havoc killing thousands of people and many properties were damaged too. Many Insurers went out of the way to ensure expeditious settlement supporting their policy holders. This week, in many Press, came the news of Madras High Court overruling an Insurance Company’s decision in denying the claim of a Shipping Company for losses caused by tsunami .. .. mind it, it was not property insured under Fire Insurance but Marine Hull Policy covering barges !! SBK Shipping Private Limited, Cuddalore Harbour entered into an insurance contract with United India Insurance Company Limited, insuring its four barges. Clause IV of the contract states that the insurance covers loss or damage to the subject matter caused by perils of the seas, rivers, lakes or other navigable waters. It also covers loss caused by other actions such as fire, violent threat and piracy; Clause V of the contract further states that the insurance shall not cover loss, damage, liability or expenses caused by earthquake or volcanic eruption. The Insurers denied the claims for damage of barges suffered by the Shipping Coy stating the losses fall under the category ‘Perils of the Sea’ and since an earthquake (not the tsunami) was the ‘proximate cause’ (as distinct from ‘remote cause’), the losses suffered by the shipping company are excluded from insurance claims. The division bench comprising Justice R Sudhakar and Justice S Vaidyanathan dismissed United India Insurance Company’s appeal saying, “We are unable to accept the argument of the Insurance company that the earthquake is the proximate cause for the damage of the vessel. On the contrary, it is the remote cause. If the tsunami, a peril of the sea, is the direct cause for the damage, there is no need to embark on further enquiry as to what is the proximate cause of tsunami. The proximity is in relation to the damage and if the claim answers the same it is maintainable,” the Judges are quoted as stating. “Scientifically it is stated that the earthquake was the cause of the tsunami, but for persons who suffered the wrath of the tsunami in TN, the earthquake is virtually a remote cause. The proximate cause for the damage caused to the property is giant tidal waves of tsunami, a ‘peril of the sea’ and not the earthquake,” the Judges stated. Perils of the sea could be defined as fortuitous accidents or casualties peculiar to transportation over navigable waters; events such as unusual violent (but not ordinary action) of waves or wind, collision of ships, striking a submerged object, and sinking. 4.1 This insurance covers loss of or damage to the subject-matter insured caused by 4.1.1 perils of the seas rivers lakes, or other navigable waters 4.1.2 fire lightning explosion 4.1.3 violent theft by persons from outside the Vessel 4.1.4 jettison 4.1.5 piracy 4.1.6 breakdown of or accident to nuclear installations or reactors 4.1.7 contact with aircraft or similar objects, or objects falling therefrom, land conveyance, dock or harbour equipment or installation. 4.2 This insurance covers loss of or damage to the subject-matter insured caused by 4.2.1 accidents in loading discharging or shifting cargo or fuel 4.2.2 bursting of boilers breakage of shafts or any latent defect in the machinery or hull 4.2.3 negligence of Master Officers Crew or Pilots 4.2.4 negligence of repairers or charterers provided such repairers or charterers are not an Assured hereunder 4.2.5 barratry of Master Officers or Crew, provided such loss or damage has not resulted from want of due diligence by the Assured, Owners or Managers. 4.3 Master Officers Crew or Pilots not to be considered Owners within the meaning of this Clause 4 should they hold shares in the Vessel. 5. Earthquake & Volcanic eruption exclusion that reads as : In no case shall this insurance cover loss damage liability or expense caused earthquake or volcanic eruption. This exclusion applies to all claims including claims under Clauses 7, 9, 11 and 13 – i.e., Collision liability, Protection & Indemnity, General Average & Salvage and Sue & Labour. As could be seen from the foregoing, ‘tsunami’ is not any named peril and Earthquake is clearly excluded peril. Though scientific explanation could be of tsunami caused by earthquake and earthquake being the proximate cause – the Court felt and directed that loss shall be attributable to ‘tusnami’ and not earthquake which is an exclusion. ~ .. and by reading the caption of newspapers, Insuring public may start thinking that ‘tsunami’ is undoubtedly a peril covered under Property Insurance [Fire Policy] – while clearly the case dealt at Madras High Court was a Marine (Hull) Policy.